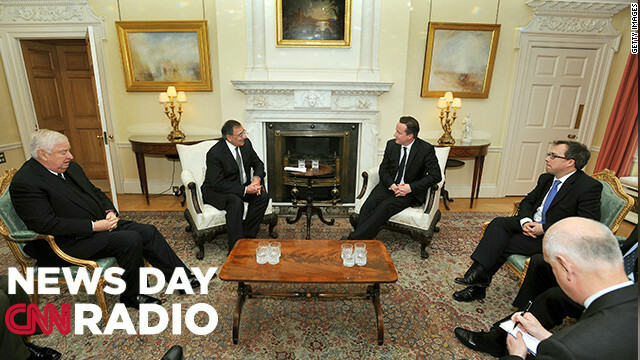 Britain's Prime Minister David Cameron (3-R) speaks with US Defense Secretary Leon Panetta (2-L) before a meeting at number 10, Downing Street, in central London on January 18, 2013. "The Algerian army had bombed the jeeps. And out of five jeeps that were bombed, four of them were hit and wiped out and they were, obviously lost their lives. But lucky enough for my brother, he was in the jeep that crashed and he was able to make a break for freedom." "The French themselves know what they are doing and they calculated that going in was the least worst option. And I tend to agree with them that going in was the least worst option. " "You don't want your language to become dead and flat. You don't want your language to be the language of service." Assuming lessing = listening, Thank you! Cnn Radio a good idea I'll be lessing to it.